Heat is energy and refers only to the transfer of this energy between or through items and not the stored energy of the item (aka its temperature). While this difference might appear to be subtle, it is very important to understand the distinction between the two, & how this transfer takes place. One other important piece to keep in mind is the second law of thermodynamics which basically states that heat only flows one way, and that is from hot to cold. Sir William Herschel first discovered the Infrared spectrum, back in the 1800’s. He was measuring the temperatures of sunlight passing through a prism. As any typical scientist would do he had a “control” thermometer & was surprised to find out that the temperature he saw was higher than he anticipated. He then realized that there must be another spectrum of light which we can’t see & the field of infrared thermography was born. Heads up – ASTM Standards all start with a single letter based on the committee’s designation (A-G). ASTM STP’s or Selected Technical Papers on the other hand are essentially conference presentations on the newest research available which doesn’t always pan out & become a standard. Many companies like using some of these STP’s to exaggerate just how well their products work. ASTM C 177 – The Guarded-Hot-Plate Apparatus. ASTM C 518 – The Heat Flow Meter Apparatus. ASTM C 976 – The Calibrated Hot Box. 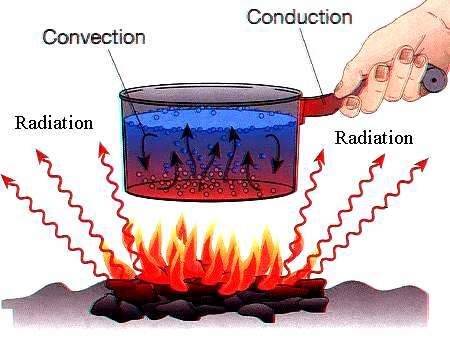 Convective heat transfer is the transfer of heat in a gas (air) or liquid via currents from one region to another. This is generally pictured in a circular format; as an item heats up this warmer air or water rises to the top and as it cools it sinks. Radiant heat transfer is simply the transfer of heat from one surface to another through space. For example you can feel this when standing outside on a sunny day or standing around a campfire. Picture credit can not be given as it is an unknown. Special shout-out to Neil Orme of Riverside Community College for trying to help out with our best guess at this time being the University of Wisconsin. 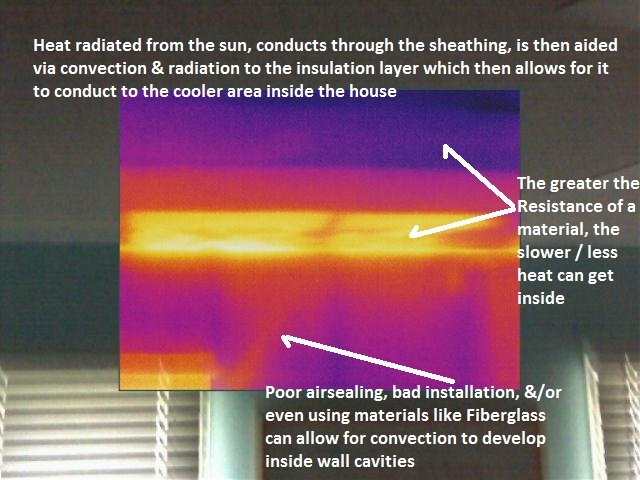 In order for a radiant barrier to work it needs a gap from the next surface in order to prevent heat from simply conducting through it. While some claim any space will work, a gap of an inch or more is preferred. FAQ: How often should I replace my smoke detector? FAQ: Should I insulate my Water Heater?